Could down with this gorgeous array of blue iris, white roses, seafood status and green button mums. 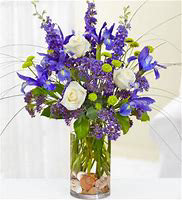 Fill To Value, White Roses, Blue Iris, Green Button Mums, Seafood Status, Bear Grass. 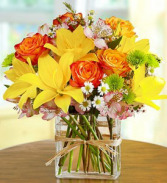 Fill To Value, Yellow Lilies, Orange Roses, Green Cushion, Astro, Monte, Greens. Send some Sunshine and Cheerio brighten anyones day! 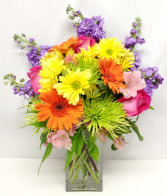 Fill your day with beauty and color with this fun and vibrant array of mixed flowers. Sunflowers Depending On Size, Stock Flower, Filler Rectangle Vase Tied With Raffia. 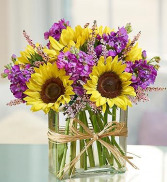 Full of Happiness the meaning of the fragrant stock flower and sunflower of course will add happiness to anyones day.